Alanna Demetrius | The Phoenix Loyola junior middle blocker Delilah Wolf and redshirt junior right side hitter Heather Kocken go for a block. 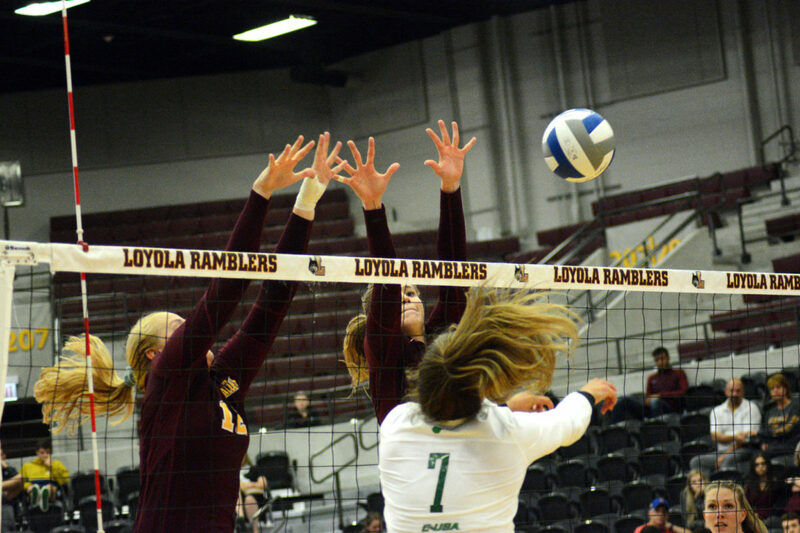 The Loyola women’s volleyball team (8-3) lost to University of Illinois at Chicago (UIC) 3-1 at Gentile Arena Saturday afternoon. The loss snapped the Ramblers’ eight-game win streak. Senior outside hitter Quinn Spieker led Loyola with 15 kills while sophomore middle blocker Elle Van Grinsven had 14. Junior setter Delilah Wolf recorded a double-double, tallying 46 assists and 12 digs. Senior libero Alex Nunez added 27 digs. In the first set, Loyola took control early, taking a 7-1 lead and forcing a UIC timeout. The Flames started to close the gap, but the Ramblers took the set 25-17. Loyola struggled early in the second set, trailing UIC 15-13 at the media timeout. The Ramblers couldn’t recover and lost the set 25-23. The Ramblers never got in a rhythm in the third set, committing nine errors as UIC rolled to a 25-16 victory to take a 2-1 lead in the match. Loyola kept pace with UIC throughout the fourth set, but couldn’t come back and fell to the Flames 25-17 to drop the match 3-1. The loss is the Ramblers’ first home loss of the 2018 season and snapped the team’s longest win streak since 2015. It also marked the team’s first loss since Aug. 24, when it fell to Samford University 3-1. The Ramblers are scheduled to take on Northwestern University tonight at 7 p.m. in Gentile Arena to close out the Chicago Cup.